SAN DIEGO — As a general principle, Phillies manager Gabe Kapler believes the No. 2 and 4 spots in a batting order should be reserved for a team’s two best hitters. But on the Phils’ just-completed six-game trip out West, their No. 2 and 4 hitters combined to go 4 for 43 with 10 strikeouts. Needless to say, Rhys Hoskins and Carlos Santana have had better weeks. 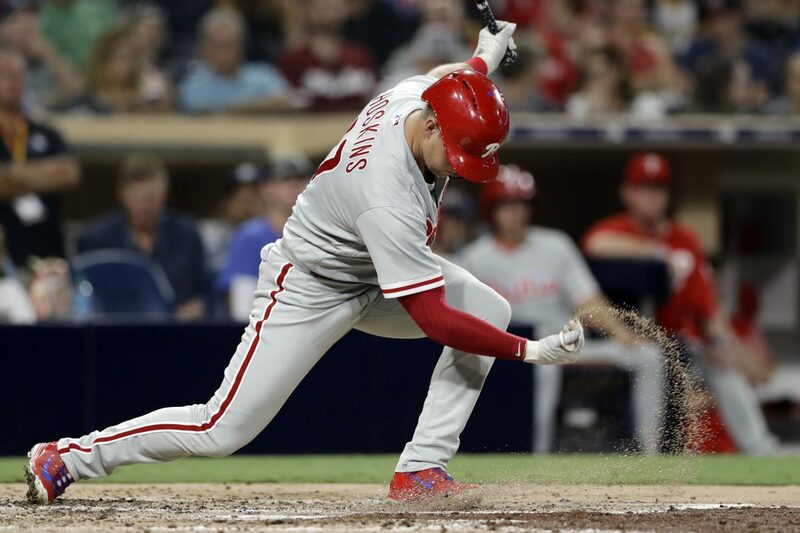 It was little wonder, then, that the Phillies generated a total of only 15 runs in the six games against the Arizona Diamondbacks and San Diego Padres. They went 5 for 41 with runners in scoring position and scored a run in only seven of the 59 innings in which they batted. At one point, they went 19 innings without a run. Kapler had a cross-country flight Sunday night and can use the day off Monday to decide whether to shuffle the batting order before the Boston Red Sox bring baseball’s best record (85-35) into Citizens Bank Park. But he has been fairly consistent about Hoskins’ and Santana’s places in the order. Hoskins has batted second in all but one of the last 55 games, while Santana has been the cleanup hitter in 54 of his last 58 starts. Santana went 1-for-4 with an RBI double in Sunday’s 9-3 loss to the Padres and finished the trip 3 for 22 with four walks and five strikeouts. He hasn’t hit for average all season (he’s down to .215), but has reached base at a good clip because of his prolific walk total (88). Lately, though, Santana said he has chased some pitches that he might ordinarily lay off because he either isn’t making contact with the ones he wants or simply is not getting them. Santana said he doesn’t prefer a particular spot in the batting order and wouldn’t balk if Kapler takes him out of the cleanup spot. “It’s been a good while that Rhys has had good at-bats and stung the baseball,” Kapler said. In his first Phillies at-bat, newly acquired first baseman Justin Bour notched a pinch-hit single in the ninth inning against soft-tossing Padres reliever Kazuhisa Makita. … With a lefty on the mound for the Padres, the Phillies gave centerfielder Odubel Herrera a day off. Herrera has four hits in his last 30 at-bats. … Catcher Wilson Ramos (hamstring) continued his minor-league rehab assignment by going 3-for-4 with three doubles as the designated hitter for high-A Clearwater.